Installing Ubuntu 8.10 on Your Desktop or Laptop Computer. Installing Ubuntu 8.10 is not very hard if you installed Windows 98, Me, XP, Vista, or Seven in the past. It is very easy to follow the install wizard, the descriptions in Ubuntu are very descriptive, so if you know how to install regular computer software or operating systems on Windows computers. You should not have too hard of a time installing Ubuntu 8.10 on your computer or Laptop. Note: If you did not burn your Ubuntu 8.10 install CD yet, and do not know how to start your computer from a CD instead of your system hard drive installed on your computer or laptop. Please visit my ubuntu.johnsonyip.com which has videos and links to resources for helping you learn how to burn the Ubuntu install ISO on to a blank CD-R or CD-RW CD with the Ubuntu 8.10 ISO which you can download from Ubuntu.com, and how to use the Ubuntu 8.10 CD you made to start your computer from a CD by setting up your BIOS, CMOS, or bootloader/startup device manager to tell your computer to start from a live install CD like the Ubuntu 8.10 install live CD. 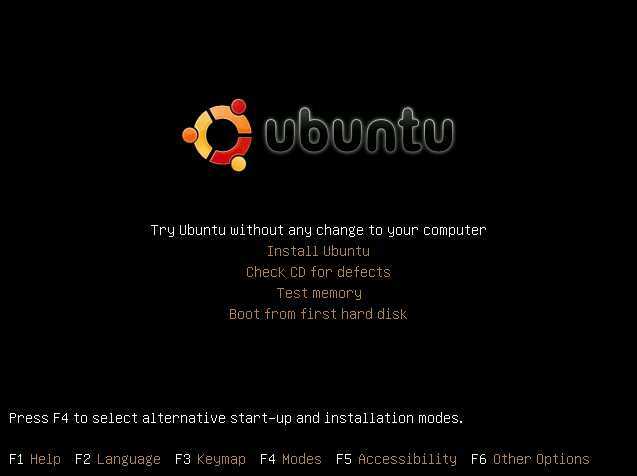 Watch my video on installing Ubuntu 9.10 and updating Ubuntu if you prefer video based tutorials. Installing Ubuntu 8.10 and 9.10 are virtually the same. There are just a few very minor differences when installing Ubuntu 8.10 vs installing Ubuntu 9.10 on your computer or Laptop. You can also use a program called VirtualBox which is like a computer simulator to practice installing Ubuntu before you install it on a real computer, so you feel more comfortable installing Ubuntu before you install it on an actual computer. If you watch my video, you'll also learn how to install Adobe flash, so you can view flash videos on Youtube, Myspace, Facebook, and other social networking websites. Here is my video I made which teaches you how to manually install and update Ubuntu 9.10 Linux which is almost the same steps you take to install and update Ubuntu 8.10 LTS on your computer or laptop. Scroll to the end of this page to find more links on helping you master Ubuntu Linux like a PRO. Before you begin the install process for Ubuntu, you should backup all your important files to a USB external hard drive, another computer, CD-Rs, or online, so you do not lose any important files. Once you Burn or buy a CD copy of the Ubuntu ISO from Ubuntu.com, restart your computer with the Ubuntu CD inside of your computer CD drive, and make sure your computer is set to run from a CD first instead of a floppy or hard drive. 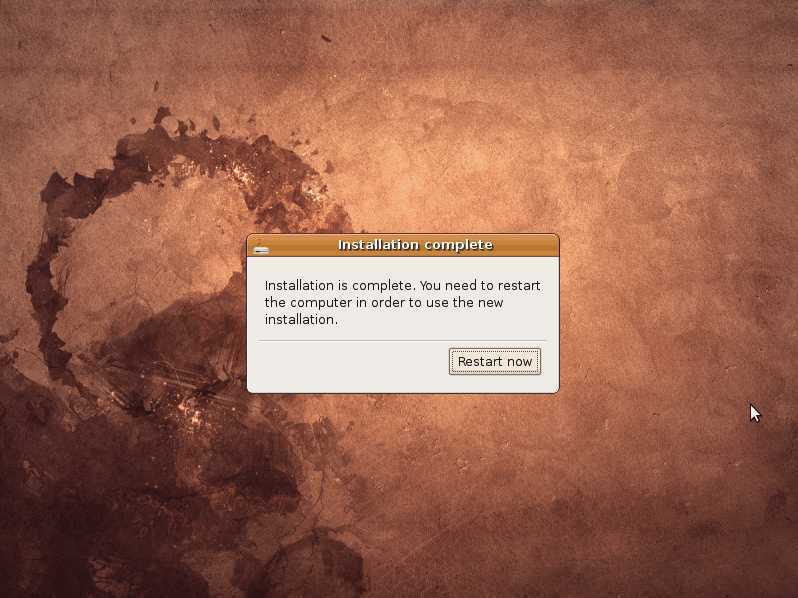 After booting your computer from your Ubuntu CD or Virtual Disk Image if you are using a Virtual machine, you can start the installation. During the installation for the first and second steps, you'll use your up, down, left, right arrow keys on your keyboard to select different options on the screen. Make sure your computer is compatible with Linux otherwise Ubuntu 8.10 will not install or run slowly on your computer. You can enter your BIOS or CMOS to see how much RAM you have, and how fast is your CPU. Also, Windows and other operating systems have tools for telling you how much RAM you have and your CPU speed. I like to use a tool called CPU-Z which tells me how much RAM is installed on my computer and how fast my CPU processor is.Download CPU-Z at http://www.cpuid.com/softwares/cpu-z.html. Sometimes Ubuntu can't start because of a video card compatibility problem, so the easiest fix is to install another video card which is known to work with Ubuntu 8.10 operating systems. I recommend using Nvidia, ATI, or Intel video cards since they are usually compatible with Ubuntu vs generic brands of video cards. If you are having installing Ubuntu, you can run the "Check CD for Defects" to see if your CD is corrupt or not. If defects are found, try burning your CD at a slower speed, or using a different brand of CD-R. I recommend Verbatim CD-R since I have not had many problems with Verbatim CD-R discs, and I read on forums, product review sites, and blogs which say Verbatim makes great CD-R and DVD-R media discs. If you tried burning your disc at a slower speed, and using a different brand of CD-R disk and your install still does not work, maybe your CD drive is broken, or the CD laser lens needs to be cleaned with one of those CD cleaner lens cleaning discs. If you are using a DVD drive, buy a laser lens cleaning disc which can also clean DVD lens cleaners since I read online that a DVD laser lens is designed differently compared to a CD drive lens, so a DVD lens can only be properly cleaned with a DVD cleaner lens. Those lens cleaning discs can be kind of expensive, so sometimes it might be more worth it to buy a new CD-ROM drive if the CD-ROM drive is very old since you can get a internal DVD Burner Drive which can also play and burn CD and DVD for around 20 dollars if you buy it online from Ebay, Amazon, or some other discount store. Step 1. Pick your language or just press enter on your Keyboard if you want to use English. Step 2. Pick Install Ubuntu which is the 2nd option from the list by clicking the down arrow on your keyboard, and pressing the "enter" key. If you want to try out Ubuntu before you begin the install pick "Try Ubuntu without any changes to the computer". You can now try out Ubuntu which will be running off the CD. If you like your experience with Ubuntu from the LiveCD, click the Install desktop shortcut from the desktop icon to begin the install of Ubuntu 8.10 LTS on your computer. This method is slower then going straight to the install screen, but you would not waste time installing Ubuntu if you hate using the desktop on the LiveCD. Do not judge the speed of Ubuntu while using it from the LiveCD since CD-ROM and DVD-ROM drives are a lot slower then mechanical rotational hard drives and solid state hard drives. Once you install Ubuntu onto your computer's hard drive, Ubuntu will start up and run a lot faster then on the LiveCD. Step 3. 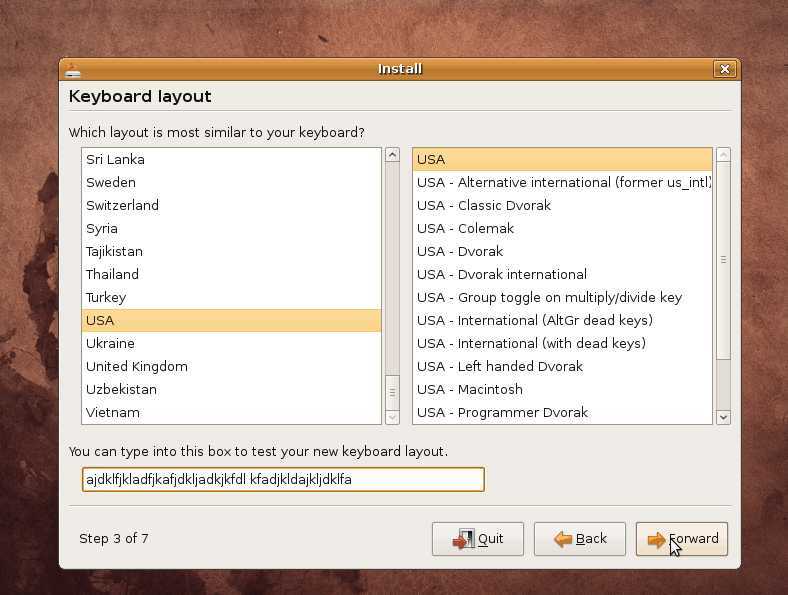 After Ubuntu loads, pick your Language then press the Forward Button with your mouse. Step 4. Pick your city by clicking the map or drop down menu then press the Forward Button. Step 5. Select the type of keyboard you are using if you are not sure, look in your keyboards owner manual, test out your keyboard keys in the test text box at the bottom of the keyboard window by pressing some keys on your keyboard, and see if the right letters, numbers, and symbols are being displayed as you type then press the Forward Button. 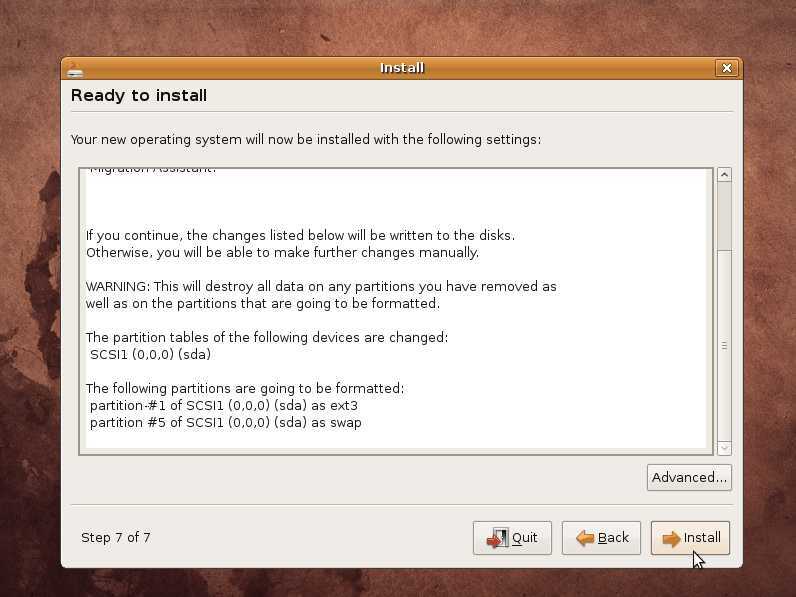 Step 6.Select the Disk you want to use to install Ubuntu onto then press the Forward Button. This will wipe all the data on your disk if you have Windows or another operating system installed on your computer. You can also make your computer a dual boot computer by following the disk partitioning wizard in Ubuntu by clicking manual instead of "use entire disk" which will erase everything on your hard drive to let Ubuntu use the full disk space on your hard drive. If you did not back up your important files like family photos. Stop the installation and backup your photos before you begin this step. Step 7. Type in your user name and password. 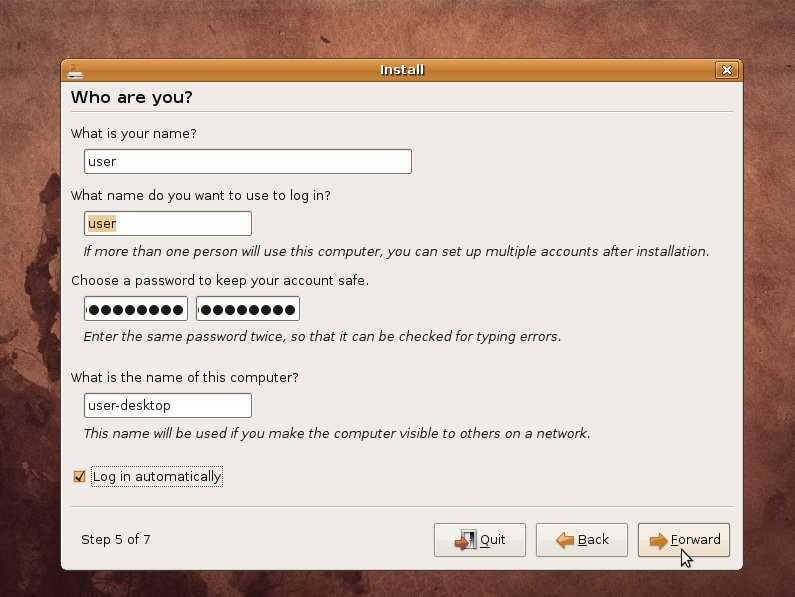 If you want to be log in automatically every time Ubuntu starts check " Log in automatically" then press the Forward Button.A good password which is hard for a human to crack is a password which have at least two of each character type which includes UPPERCASE, lowercase, Numbers:1,2,3, and Symbols like (,$. Step 8. Press the install button. A bunch of pop-up windows might pop-up they will be gone after your Computer finish installing Ubuntu. Make sure to not turn-off your computer during the install process which might take a few hours or less depending on the speed of your computer. Step 9. Wait for your computer to finish installing Ubuntu, then press the Restart button. Ubuntu should be installed on your computer now. Remember to remove your Ubuntu 8.10 install CD during computer start up. To speed up computer start up everytime you start your computer, you can set your computer to start from a hard drive again in your computer's BIOS or CMOS, so it does not look for a CD or floppy drive on your computer during computer start up, and can start your computer from the hard drive first. Congrats, You successfully installed Ubuntu 8.10 LTS Linux on your Computer. Now that you installed Ubuntu, you most likely want to install 3rd-party software to enhance your experience with Ubuntu, so read my tutorials on installing third-party software in Ubuntu. A lot of these tutorials were made with newer versions of Ubuntu Linux, but they should also work for Ubuntu 8.04 since there are not many user interface changes in newer versions of Ubuntu vs Ubuntu 8.10. Tutorials from my Linux Help section on my Computer and web design section on my blog. If you need more help on installing software for Ubuntu, take a look at my resource links for helping you use Ubuntu. The official site for Ubuntu.com where you can buy or download the Ubuntu CD ISO, and read its website docs for getting help from the official website of Ubuntu Linux. A Ubuntu Help site I made for helping newbies to more advance users use Ubuntu for their daily tasks like office work, playing flash games, web browsing, and playing back their multimedia files like music, videos, and picture files on their computer running Ubuntu Linux. Section where I post all my blog articles related to Linux and Ubuntu on my Computer help and web design blog on JohnsonYip.com/wordpress.